If price is the deciding factor, then the attractive linear imagers of the Datalogic Touch TD1100 series are at the top of the list. The hand scanners are a corded solution for retail, maintenance, warehousing and the workshop. They deliver reliable performance in capturing conventional 1D, postal and stacked codes, particularly using applications with a low to middle output of goods. The Touch TD1100 series is designed for short reading distances, from direct contact up to a maximum distance of 15 cm. In order to meet the most varying requirements Datalogic offers the Touch TD1100 imager series with 2 reading widths and various connection combinations. This guarantees target-oriented operation with the appropriate device, plus you only pay for what you actually need. The Touch 65 Lite reads up to 6.5 cm wide barcodes; the Touch 90 Lite up to 9 cm wide barcodes, and both are available with a dual interface. An additional variant in the series are the Touch Pro models with a multi-interface. They offer the same scanning performance; however, they combine the complete connection versatility in one device: USB, RS232 and keyboard wedge interfaces are all at your disposal, in a single device. The user recognizes a successful scan in two ways: by an adjustable acoustic tone, plus an easily recognizable green LED. These imagers greatly speed up the work process, thanks to their smart design: the housing meets ergonomic requirements, and its light weight sits comfortably in your hand. The 130 g of the Touch 65 and 150 g of the Touch 90 are hardly noticeable, even after hours of usage. Even when it comes to tough environments, or in areas with increasing temperatures, the Touch imagers are the right choice. They are robust enough to withstand repeated drops from a height of 1.5 m, plus they deliver maximum performance, even in extreme temperatures up to 50°C. 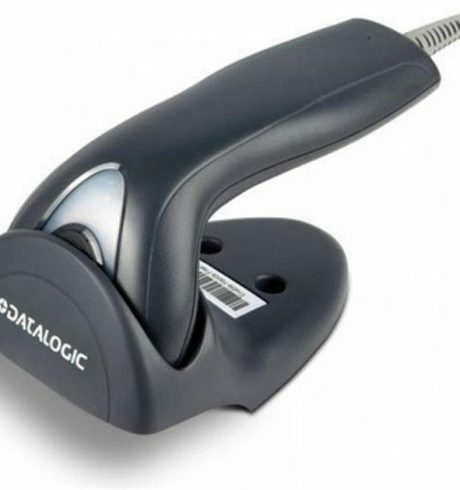 As needed order a holder for the Datalogic Touch TD1100 series, so that you can also scan small parts or documents hands-free. Not only does this greatly expand functionality, it also increases flexibility. A 5-year warranty protects your investment over a longer period of time and promises you planning certainty.